A couple of weeks ago – was it that long? Who can keep track of time when it is haphazardly marked by constant movement? 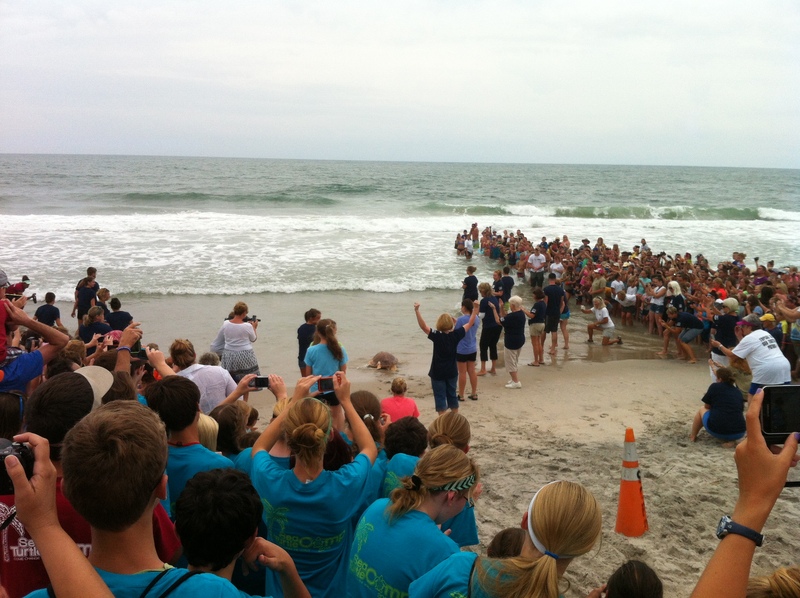 – I stood on a dune at a North Carolina beach, cheering and crying with a couple of hundred strangers and a few people I know very well, as a 300-pound turtle found her way back into the ocean. In a summer full of significant moments, this may have been one of the most pure. To backtrack: earlier that week, I visited the Karen Beasley Sea Turtle Rescue and Rehabilitation Center in Surf City, NC. It’s an impressive, altruistic labor of love run by volunteers, where I learned all sorts of things, and is such an inclusive, effective endeavor that I walked away with a sense of investment in the project – even though I previously felt no special affinity for sea turtles. The turtles come into the Center for a range of reasons; boat propeller injuries and “buoyancy issues” were common causes. They live there, in individual tanks, until they can either be successfully released into the wild or placed in an educational setting, like an aquarium. Occasionally, there is a turtle like one named Lennie, who – blinded by blunt force trauma that the Center suspects might have been caused by a hammer – will live at the Center permanently (so much sadness, in that action, to take a hammer to a sea turtle’s head, and I wonder at the pain in the person’s life who did it). As for Shellie, she had been at the Center for about a year, as she healed from what was likely a shark attack; a chunk of her shell was permanently gone. I wonder what she thought of during all those months in that small tank, being cared for by humans who don’t normally cross her path. Could she tell that she was healing, and that these strange creatures were helping her? Or did it feel like torture, sitting in that small tank, missing all that she knew? I almost didn’t go to see her return to the ocean. I thought about staying at the beach house, tucking into a nap to combat the sweet effects of sun exhaustion. I figured that it wouldn’t be that interesting to watch. What do I know about sea turtles? What do I really even care? Could be totally anticlimactic, I told myself. I could go to a coffee shop and write, I reasoned. But: because I could go to a coffee shop and write anywhere, I figured I’d go watch a sea turtle release, which I’ve never before had the chance to witness, instead. What would I have written about, had I not witnessed Shellie’s return? I think about the concept of home pretty frequently; maybe that. If you’ve visited this page on a regular basis, you’ve already seen that theme emerge, and it’s almost sure to continue. This month marks the 20th anniversary of my parents’ separation. I was in high school at the time, and on the day that my parents officially split up, my boyfriend took me somewhere I no longer remember. By the time he brought me back, I lived somewhere else altogether. At my dad’s house, I had windows facing a street I knew well and walls I eventually painted a color called “Geranium.” At my mom’s, I had a cozy little nest of a room in the basement with a half-bath mainly to myself. I felt many things about their separation, but because it was a long time coming, I mainly felt relief, glad that it seemed like maybe we could let go of pain from our past and rebuild our family in a new way. We have done that, with successful and not-so-successful moments along the way. But I was too young to know that some of those changes would stick with me for years, in ways I couldn’t imagine. One of the biggest impacts of that day is that since then, I think I’ve been searching for home (cue Hallmark Channel music), an idea that was formed in adolescence, surely, as the quest for this one single place where I fit perfectly is not of adult design. 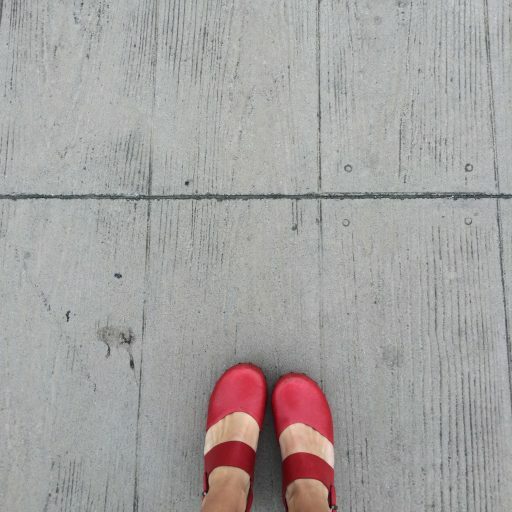 Sometimes I feel like a character in a children’s board book: “Are you my home?” I ask the question again and again, every time I move, waiting for the nuances of a new dwelling – the built-in bookshelves or the corner where I tuck my desk – to answer. It always leads to more questions, for the truth is that I’m never quite sure of what I’m seeking. What is home? Is it the connection to a certain square of earth? The bonds formed by blood or experience within a group of people? The sum total of the many trinkets I haul from one place to another? I know that it is an indulgence, a reflection of my privilege, to ask such questions. Today I passed a man walking along the street, pushing one metal shopping cart filled with paintings and pulling another metal shopping cart filled with belongings. There was a sign on the back of the latter. Homeless, it said, in large letters, and I wanted to pull over and buy everything he could sell me. Those two carts, crowded past capacity and filled with necessities and art – which maybe is a necessity – is that home, for him? Is it enough? 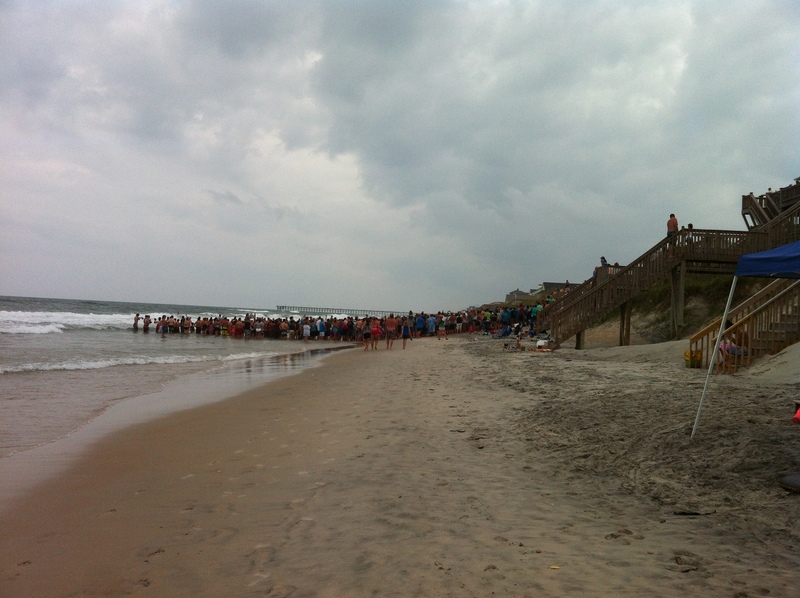 Shellie’s release was scheduled for 12:30; half an hour before then, I walked down the beach with friends. We didn’t have to wonder where exactly to go; on an otherwise sporadically-filled beach, the crowd served as its own landmark. Quite an impressive turnout for one not-so-little turtle. When we arrived, I scrambled up to a perch were I could get a good look at everything as it happened. I can’t communicate the excitement – the crowd was absolutely buzzing – that surrounded this event, and I wondered if it was simply the promise of a distraction from lazy, worry-free beach-living that brought everyone together. But then they brought Shellie out. Cradled in the hands of several volunteers, Shellie approached the water on a path that divided the crowd. Her handlers struggled to keep a grip on her; by the time they reached the flat part of the beach, Shellie was struggling to get free. Her movements looked an awful lot like joy. Such an ancient, wise face. The volunteers set Shellie down, perhaps a bit earlier than they meant to, a bit more awkwardly than they’d planned, brought to the sand by the excited movements of a 300-pound turtle. And Shellie knew exactly what to do: she headed for the water, flippers propelling her forward, tumbling one over the other in a quick and surprisingly graceful waddle. The crowd silenced. After all those months in a small tank of water, with care from humans who don’t usually mean something good in her life, what was she remembering? Could it be only instinct, or was Shellie suddenly flooded with moments from her past: her family, her babies, her good times with turtle friends? Whether it was the sound or the smell or the sight or a rush of memories in a turtle-language that I cannot speak, I will of course never know, but it was clear – I believe to everyone in the crowd – that Shellie knew she was home. Within moments, she was in the ocean where she belonged. At one point, she crested on waves back into sight, and it seemed to me like maybe she was waving. Everyone cheered, and then – really – she was gone. As the crowd dispersed, I heard people telling each other exactly how I was feeling: that was amazing, awesome, the coolest thing they’d seen in ages. I thought about it as I walked back to the house. Why were we all there? Bragging rights? A story to tell around the proverbial water cooler? It wasn’t that everyone there loves sea turtles. I think it was something else, something about the fact that maybe we can each relate to the experience of losing, and then finding, our way back to the place where we are most ourselves. In the last several months, I’ve finally started to understand that home is not a single place, or a single set of people, or a single collection of souvenirs I’ve gathered up as I’ve traversed the highways of my life. Instead, I am starting to find home in many places: in the houses of good friends, in the cities that I’ve fallen in love with, in the corners of nature that I have never visited but still inherently understand. I find home in many books and in very specific paintings; in the banana bread and sugar cookies my mom bakes; in the way my dad can talk about the weather with passion and knowledge; in the language I use with my siblings, the one that only we can speak fluently. I find it in laughter, and the joy that I experience when I am spending time with my very closest friends. Home: it’s in the red earth of Oklahoma, the golden hills of northern California, the weighted humidity of the Gulf Coast, the smart swagger of DC, and the hard-won quirky bits of Baltimore that still weep when no one is paying attention. It is true that I have not yet identified a single structure in which to house all my ideas of home, but would that even be possible? I am starting to wonder. My dream has always been to have a place I go when I am not adventuring elsewhere. Yet how could that home I create, with walls that keep out the sky, and doors that lock against the world, ever hold all the homes that I find outside of myself, the pieces I’ve scattered about or handed to others, the parts of myself that are known to me only through the reflection granted by those who love me? And how could it ever hold all of those people I want to invite in? Surely they could never all fit into a living room or a kitchen or even on a generous front porch, except in spirit, except in the gifts of wisdom, experience, and presence that they have each given me, and that I have hopefully returned in kind. 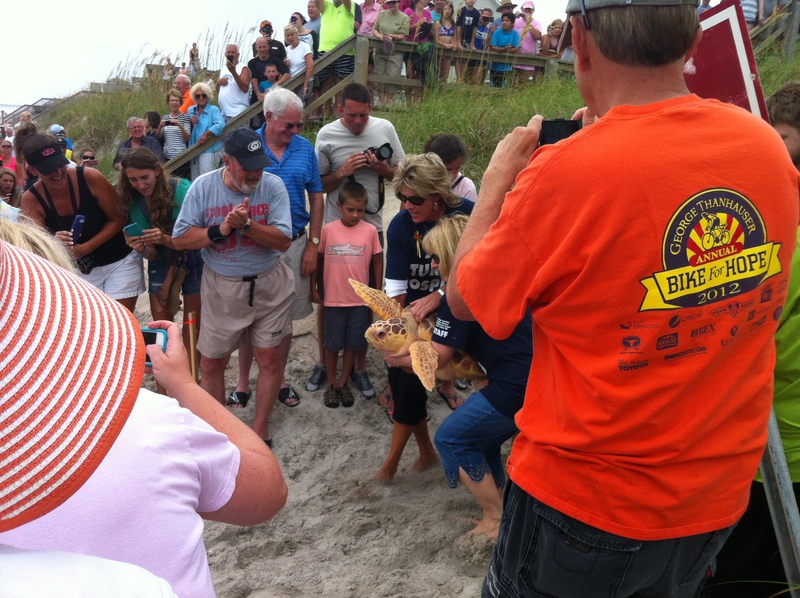 How could a sea turtle fit into one abode, without access to the beach, the ocean, the world? I think of those houses into which my family split, the Geranium walls and the cozy nest, and know those come with me whenever I move my life along to someplace new. I cannot separate them from myself, and I do not need them in my hands to make them real. A few days after Shellie’s release, I kissed my friends’ children goodnight, at the kids’ request, going into their bedrooms after their parents had tucked them in. I’ve known these boys their entire lives, and soon enough, they’ll be adolescents, and young men, and then adults themselves. They won’t remember a summer night when they reached up with their sweet little-boy arms to hug me, as I told them each in turn that I love them. But maybe they’ll remember, all those years from now, that I was part of their home. I wonder about the underwater lives of sea turtles, in awe of the endearing quest of so many creatures. I am merely one of an innumerable group. And now the question becomes, when I think of this upcoming move, does this knowledge grant me the freedom to go, or the freedom not to? 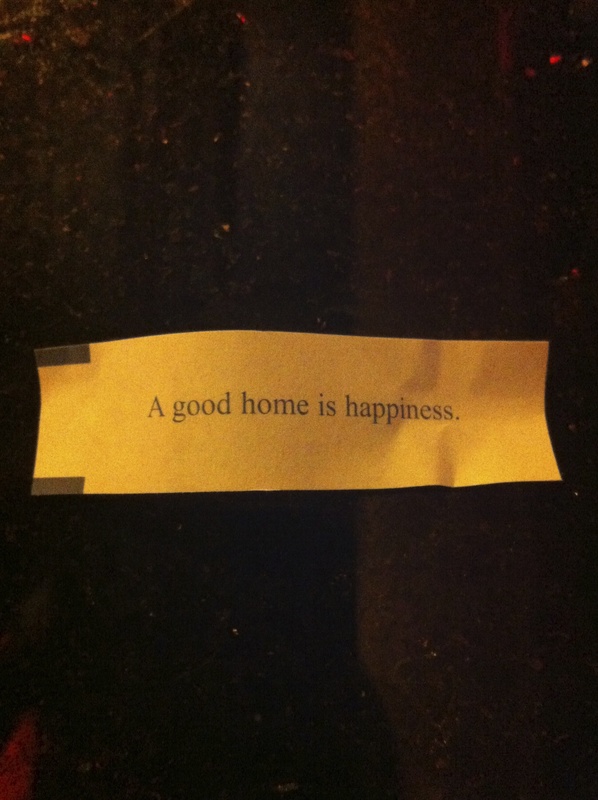 This fortune doesn’t even need anything added to the end of it. This entry was posted in Home. Tagged beauty, growth, nature, sea turtle, summer, turtle.